Regain confidence and your health with our weight loss programs. Find out how to get started today! 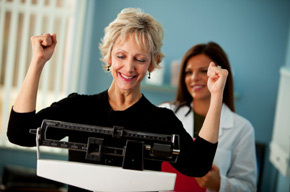 We offer weight loss programs to meet the individual needs of each patient. Each program is doctor supervised and you meet with an experienced diet coach to guide you and ensure success. We realize effective weight loss involves three (3) important steps: stop gaining weight, lose weight and keep it off. Our individualized approach (not group sessions) has shown to be highly successful in helping each patient achieve their weight loss goals. Our Individualized Weight Loss program is based on the book Why You Can’t Lose Weight, by Pamela Smith, MD, MPH. If you have had difficultly with you weight and been unsuccessful in loosing weight or keeping it off this program may be the answer you have been looking for. This is a medically based weight loss program that will examine the most common reasons why people can’t lose weight as they relate specifically to you. As you are individually assessed, we will guide you in overcoming the obstacles that stand between you and a slimmer, trimmer and healthier body. Area 1: Lifestyle Practices: exercise, fiber intake, food addictions, sleep deprivation, stress and water intake. Area 2: Health Problems: food Allergies, chronic inflammation, thyroid hormone dysfunction, toxic build-up, and yeast infection. Area 3: Biochemical Factors: depression, female hormone imbalance, genetics, insulin resistance, male hormone deficiency, neurotransmitter dysfunction and pregnenolone insufficiency. Once these above areas are evaluated, we will then provide specific recommendations for improvement to help you achieve your weight loss goals. How often you meet will depend upon your individual obstacles and needs identified in each of the above areas. Initially, you will probably meet 3-4 times a month until you reach your weight loss goal and then maintenance visits to help you stabilize your weight. A variety of assessment and treatment tools and methods will be utilized. Assessment will include questionnaires, lab work including serum (blood), urine and saliva. Treatment recommendations will relate specifically to you based on your individualized assessments. These treatment recommendations will include specific lifestyle, nutritional , dietary, supplement and hormone replacement therapy recommendations. This program may be used separately or inconjuction with our HCG Weight Loss Program. Since this is not a one size fits all standard diet program, the cost will be dependent upon the time spent with Dr. Fred Arnold, NMD or Jodi Arnold (Diet & Lifestyle Coach). We will work closely with each patient to help them reach their ideal weight and stop the “yo-yo diet” problems so many people experience. We welcome your questions and the opportunity to help you reach your weight loss and health goals. FirstLine Therapy (FLT) is a 12 week program that includes doctor consultation and evaluation, blood chemistry analysis, measurement of BMI, percent body fat, nutrition assessment, and development of an eating plan. Each patient receives individual sessions designed to inform, motivate and support individuals in making lifestyle changes. The FirstLine Therapy (FLT) program’s basic principles are in accordance with the most current scientific research. One of the reasons diet and exercise programs fail is they are one-dimensional-- that is, they focus only on weight loss. But FirstLine Therapy (FLT) isn't just about weight loss, it's about achieving a lifetime of good health. So instead of counting calories, you'll learn simple steps to help you take control of your specific health situation and easy ways to track your progress, tips for success, reminders, and other support that will help you achieve your goals and maintain your health improvement. Most weight loss programs leave you feeling hungry, FirstLine Therapy (FLT) helps you eat the right foods to help you feel full. Many weight loss programs result in loss of muscle mass. Muscle mass regulates metabolism and insulin function. FirstLine Therapy (FLT) helps you build muscle mass. This improves your overall health and helps you to keep weight off. FirstLine Therapy (FLT) will help you address the underlying causes of common health problems. By providing you with the necessary tools you can take control of your health. The goal is to help you live your life in a way that improves your health. With FirstLine Therapy (FLT) you can feel good now, and maintain good health for years to come. Food truly is medicine and with the FirstLine Therapy (FLT) we can help you understand what’s best for you to achieve optimal health. The Fat Burner Shot is a specialized shot to promote weight loss offered by our office. It is referred to as Lipotropic because it promotes fat burning and weight loss. Lipotropic agents are a class of substances that play an important role in the body’s use of fat. Many substances have lipo¬tropic properties of which choline, inositol and methionine are among the most noteworthy. Through their involvement in lipid (fat) metabolism, lipotropics help maintain a healthy liver. They prevent the accumulation of fats in the liver. A fatty liver can cause a sluggish liver function. They detoxify amine (by-products of protein metabolism) This is important for people on a high protein diet. They increase resistance to disease. They bolster the thymus gland to carry out its anti-disease function by stimulating 4. the production of antibodies. Stimulating the growth of phagocytes, which surround and gobble up invading viruses and microbes. They also recognize and destroy foreign and abnormal tissue. Choline & Inositol are co-enzymes that are required for the proper metabolism of fats, and have the ability to remove fat from the liver. Choline works well with inositol to utilize fats and cholesterol. The body can produce choline, with the help of vita¬min B12, folic acid and methionine. Choline: Metabolizes fat. Deficiency of Choline can lead to Cirrhosis and fatty degeneration of the liver and hardening of the arteries (arteriosclerosis). It is being used today for ailments such as gall bladder trouble, diabetes, Muscular Dystrophy, Glaucoma, senility and memory problems (forgetfulness). Choline detoxifies amines that are the by-products of protein me¬tabolism. Inositol: Deficiency of Inositol can lead to hair loss. It works with Vitamin E to facilitate its actions in the treatment of Muscu¬lar Dystrophy. It is used in nerve and muscle disorders such as Multiple Sclerosis and Cerebral Palsy. Caffeine may cause depletion of Inositol. Methionine: It works with Choline to detoxify amines which are the by-products of protein metabolism. It acts as a catalyst for Choline and Inositol, opening up their function. Along with Choline it aids in reducing liver fat and protects the kidneys. They are supplied in injectable form. Dr. Fred Arnold generally prescribe 2 cc per week injected intramuscularly. Mobilizes the fat and helps to break it down, it has Vitamin B6 to help you lose your water weight and Vitamin B12 which boosts your energy level.